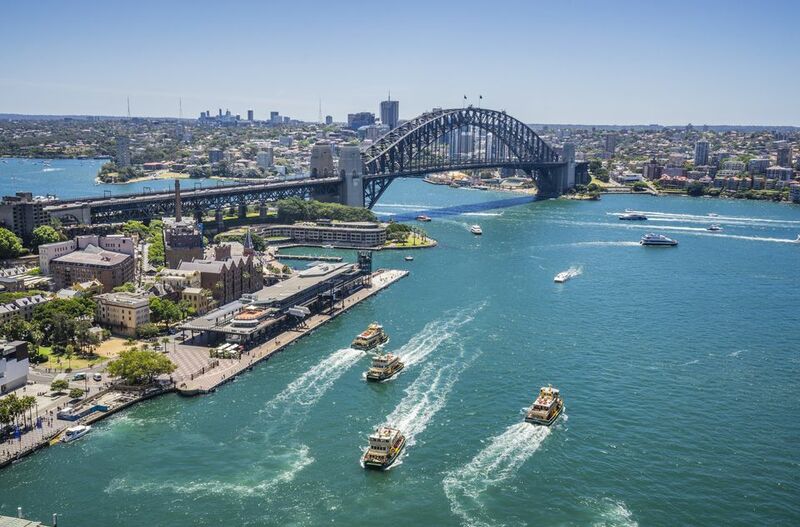 Sydney's Circular Quay is a logical starting point for a walking tour of the city as this is the most accessible transport hub for ferries, trains, and buses. From here, you could, for instance, take the walking tour to The Rocks. This time, you start from here for a walking tour -- to the Sydney Opera House and the Royal Botanic Gardens, then through a number of other Sydney attractions -- to Hyde Park in the heart of the city. From there, if you wish, you can continue the tour to Darling Harbour. Walk east from Circular Quay. Turn left (north) into Circular Quay East with the water at your left and a row of apartment buildings and restaurants at your right. You won't miss the Sydney Opera House, a United Nations-inscribed World Heritage site. If you wish, and if you have the time, there are organized Opera House tours for you to take. Or you can simply walk around, and through the open sections of, the building. Here's information you may want to look at. From the Sydney Opera House, walk east close to the water. There should be a gate there that leads you into Royal Botanic Gardens Sydney. This is a popular place not only for those interested in different types of flora but also for those seeking respite from work or for grounds to have a stroll or a picnic. It's best to have a map so you don't go around in circles in the gardens. Government House, which used to be the home of the New South Wales Governors, sits on a knoll in the gardens. It is now a museum and houses art and artifacts. Royal Botanic Gardens Sydney are normally open to the public from sunrise to sunset. You reach Mrs. Macquaries Point by following the curve of Farm Cove east of the Sydney Opera House. The point offers a breathtaking view of the harbor with both the Opera House and the Sydney Harbour Bridge providing the perfect backdrop for picture taking. This place has been made famous as a "getaway" spot for Elizabeth Henrietta Macquarie (1778-1835), wife of Lachlan Macquarie (1762-1824) who was Governor of New South Wales from 1810 to 1821. A rock formation on the point, where Mrs. Macquarie used to sit, is known as Mrs. Macquaries Chair. (For those mystified by the apparent lack of apostrophes in certain Australian place names, this is the style adopted by the Australian Geographic Names Board.) It is said that if you sat in Mrs. Macquaries Chair and made a wish there was a great chance your wish would be granted. Walk generally southward along Mrs. Macquaries Rd with Woolloomooloo Bay on your left. After crossing the bridge over the Cahill Expressway, Mrs. Macquaries Rd becomes Art Gallery Rd where you find the Art Gallery of New South Wales at the northeastern end of The Domain. The Domain is a large grassy area set aside for public recreation by founding New South Wales Governor Arthur Phillip in 1788. The Domain, separated from the Royal Botanic Gardens by Cahill Expressway, was also the site of Australia's first farm. The Art Gallery of New South Wales houses extensive art collections including Australian art from the colonial period, Asian and European art, and an extensive Aboriginal collection in the Yiribana Gallery. The Art Gallery is normally open from 9 am to 5 pm daily. Entry and scheduled tours are free to the public. Visiting exhibitions usually charge an entry fee. Walking west from the Art Gallery of New South Wales along Art Gallery Rd, you reach Queens Square at the northern end of Hyde Park at the start of Macquarie St (which leads to the Sydney Opera House). At the corner on your right stands Hyde Park Barracks designed by emancipated, and famed, convict architect Francis Greenway (1777-1837). Hyde Park Barracks was originally built as convict quarters, then became an immigration depot and later a women's asylum. The Barracks, now housing a museum on the building's history and Sydney's colonial life, are open from 9.30am to 5 pm daily. There is an entry fee. There is an outdoors front yard cafe. Retrace your steps to the corner of Art Gallery Rd and College St to see and enter St Mary's Cathedral. This is the mother church of Australian Catholicism built on the site of the first Sydney cathedral built earlier in the 19th century but which had gone up in flames in 1865. The foundation stone for the present cathedral was laid in 1868. Tours of the cathedral and crypt are available at noon on Sundays from the College St entrance. Walk further south along College St and you find the Australian Museum at the corner of Park St. The Australian Museum is a natural history museum with an extensive Australian wildlife collection as well as archeological items and displays from the beginnings of time. One of its galleries traces Aboriginal history from the Dreamtime to the present. The museum is open from 9.30am to 5 pm. There is an entry fee. The Anzac Memorial at the southern end of Hyde Park is also often known as the Sydney War Memorial and is the destination point for Sydney's traditional Anzac Day parade. The Memorial contains an exhibition of pictures and other memorabilia from the wars in which Australia has been involved. Pine trees around the Memorial were grown from seeds gathered at Gallipoli where diggers from the Australian and New Zealand Corps fought valiantly and well in World War I. Take a stroll now through Hyde Park from south to north, crossing Park St which divides Hyde Park into two sections. Enjoy the trees, shrubs and other greenery which line the paths, and the flowers that bloom riotously in the spring. At the end of the central pathway, you'll find the Archibald Memorial Fountain, from where (if you wish) you can continue your Sydney walking tour all the way to Darling Harbour and its many attractions.